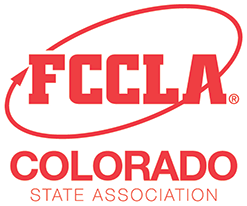 Over 1,200 students, advisers and guests experienced the “Everlasting Tale” at the 2018 FCCLA State Leadership Conference at Marriott DTC Hotel April 5-7. SLC was full of many new and exciting opportunities for members to enjoy. Attendees imagined a tale in youth sessions and the World’s Expo, lived your tale through competitive events, and furthered a tale in the friendships you made. This conference celebrated the tale that Colorado FCCLA wrote this year. Colorado FCCLA would like to thank Michelle Dennis, Cynthia Hoeppner, Bailee Gardunio, Kayelani Kirschbaum, Lettha Plecker, Victoria Connor, Tara Bell, Jen Girvin, Metropolitan State University of Denver, JC Penney, RTD Denver, all the event consultants and judges, state officer team advisers, and everyone who contributed to making our conference a success! We would like to congratulate the following members for being elected as the 2018-2019 State Executive Council. Congratulations to the chapters that have National STAR Event qualifiers and will represent us at the National Leadership Conference in Atlanta this summer! Bollman Tech, Boulder, Briggsdale, Centauri, Chaparral, Cheraw, Cherry Creek, Columbine, Coronado, Douglas County, Eaton, Fort Collins, Fort Morgan, Fossil Ridge, Frederick, Fruita Monument, Golden, Highlands Ranch, Holmes, Holyoke, Legacy, Loveland, Mead, Meeker, Merino, Mountain View, Mountain Vista, North Arvada, Northglenn, Platte Valley, Pomona, Ponderosa, Rocky Mountain, Roosevelt, Roy J. Wasson, Sanford, Smoky Hill, Springfield, Trinidad, Warren Tech, Windsor, and Wray. The 2017-2018 State Executive Council would like to recognize all of the following individuals who received state awards. North Arvada Middle School and Mesa Ridge High School won the Go for the Red Membership Award for having the largest percent member increase. Mountain Vista High School FCCLA winning the Go for the Red Membership for having the largest numerical member increase. Colorado FCCLA thanks all advisers for your hard work making the 2018 State Conference a success!